SINGAPORE - Whenever she was at home, she would notice men entering the next-door flat at hourly intervals or hear keys unlocking the door. The teacher, 58, said that though her two neighbours had been living in the four-room HDB flat since January, she hardly saw them. Once, when she saw one of them and tried to strike up a conversation, the woman scurried away without saying anything. 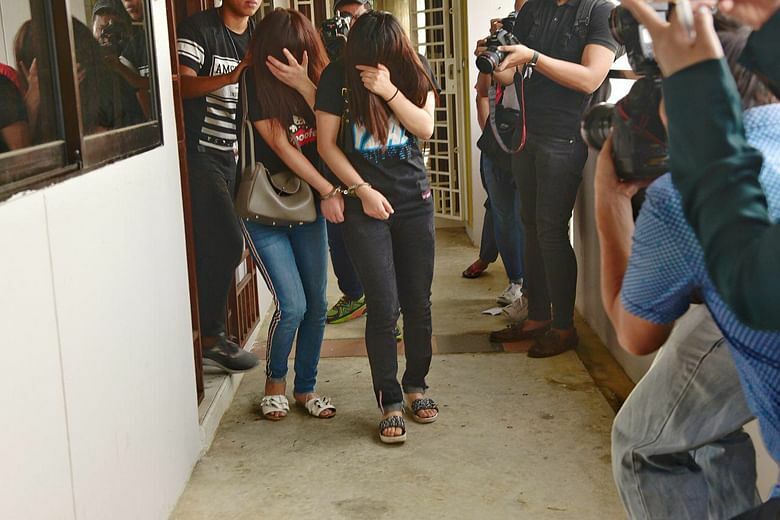 On Tuesday (April 10), police arrested two women from China, aged 28 and 44, for alleged involvement in vice-related activities at their flat in Woodlands Drive 14. The teacher said she did not suspect her neighbours despite their strange behaviour. "If I knew about this earlier, I would have informed the police," she said. The arrests were part of a 22-day anti-vice operation, which ended on Tuesday. Officers from the Criminal Investigation Department and the six Police Land Divisions took part in the islandwide raids on multiple locations, including residential units and condominium developments. The areas included Clementi, Jurong West, Sembawang and Yishun. A total of 134 women and two men, aged between 23 and 50 years old, have been arrested. Flat owners are encouraged to conduct regular checks on their tenants to ensure that vice-related activities do not proliferate in residential estates. Tenants caught misusing their flats will not be allowed to rent an HDB unit for five years. "Flat owners who knowingly rent their premises to any person for vice-related activities will be prosecuted and shall be liable, on conviction, to a fine not exceeding $3,000 or to imprisonment for a term not exceeding three years, or to both," the Singapore Police Force (SPF) said in a statement. In the case of a second or subsequent conviction, flat owners face a fine not exceeding $10,000 or imprisonment for a term not exceeding five years, or both, the SPF added.